The 10 horse power boats have seats for maximum 5 people and are 13 feet long. Good for families with children or 2 couples. If 5 or more adults we would like to recommend the 20 horse power boats. Fishing is a good combination! Gas is included and life jackets we have from 5 kg and up to 90+ kg. Welcome and have fun! Active Geiranger wants to give you an active holiday in Geiranger. We offer rentals of motorboats, kayaks, guided trips and fishing equipment. We are located in the reception of Grande Hytteutleige and Camping. Grande is located 2 kilometers from the center of Geiranger. 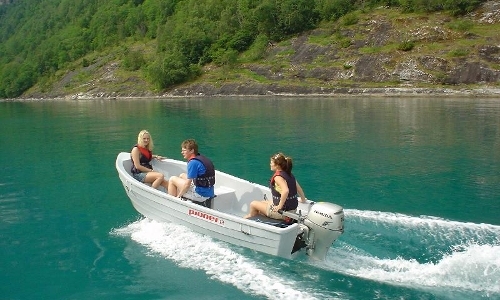 Join us for great experiences by the famous Geirangerfjord!